See any Albany brochures is this array? I couldn’t find one. With a couple of hours to kill in the international arrivals hall at the Portland airport Saturday, I spent a few minutes checking out the brochures at the Oregon Welcome Center there. I noticed that among the glossy invitations from Salem, Corvallis, Eugene and even Monmouth, Albany was conspicuous by not being there. The city of Albany expects to take in more than $1 million this fiscal year from the “transient lodging tax” collected on the city’s behalf from guests paying for rooms at hotels. You’d think that in all that loot, there’d be a little set aside for the kind of slick brochure that other Willamette Valley destinations have produced and put on display where foreign visitors first set foot in our state. How to spend the room tax money has been the subject of city council discussions. The council appointed a special committee, headed by Scott Pierson, a member of the city budget committee, to deal with the question. The panel has been meeting every month since March and has another session scheduled Tuesday (3 p.m. Sept. 5, Santiam Room, City Hall). This budget year, the room tax revenue money is distributed among the Albany Visitors Association, the Albany-Millersburg Economic Development Corp., the Downtown Association, and numerous other “activities.” Those are not enumerated in the budget but they include, among others, the Art and Air Festival, capital improvements at the city airport, and allocations for law enforcement work in connection with events. One of the items of contention has been whether more of the money should be dedicated strictly to attracting visitors that would stay in local hotels for more than one night. If the idea is to maximize room tax revenue so that all those can keep getting funded, than promoting more stays Albany tax-collecting motels seems like an item that doesn’t need much debate. If you don’t advertise, no one will know about you. While this may be appealing to the Know Nothings occupying Albany’s power chairs, the attitude will continue to make Albany the pariah it has always tried to be. Why else would the council and mayor vote to ban recreational pot sales? Our leaders should be required to consider possibility, not stifle it. Your last two paragraphs go right to the heart of the issue IMO. Exactly how can you directly measure any marketing effort? And absent that, how can anyone say those efforts are not doing their job overall? Yes, and I explained how to do it. That is how I knew it was possible. Not sure where you explained measuring the nebulous but ….um..yeah. Carry on. It seems like the tax is self-serving: it’s main purpose is to generate more tax revenue. As such, just get rid of it! We don’t need to “promote” anything. Let’s just be a nice place to live. Albany will never be a destination city. So the failure here is clearly with the Albany Visitors Association, AMEDEC, and the Chamber of Commerce. These are private sector organizations that have assumed the lead in encouraging economic growth. While they have successfully argued for some public financial support for their efforts, it’s their responsibility to make things work. On the other hand, maybe these airport displays aren’t worth the effort for the return they generate.Does anyone have solid data to show how effective the various efforts have been by these organizations to create economic growth.? Room Tax. One of the widest spread conspiracies between cities. You tax our citizens without representation and we’ll do the same to yours. Win win for both of us and the sheep are no wiser. Clueless Kapauun strikes again. The Room Tax authority was put into place by a vote of the Oregon Legislature, with requirements telling cities and counties how to implement ,if they so choose, through their local legislation. To say the tax is implemented without representation is a bald faced lie. You are so right about Albany missing from those PDX racks. Albany Visitors Association agrees with you that we should have a presence in ALL of Oregon’s welcome centers including PDX. Unfortunately, there is a cost associated with that presence. Each year AVA staff, with the help of Duhn & Associates, a professional magazine publishing company, creates an Albany magazine that relates information about the attractions and events in and around Albany. Some locals don’t realize what an interesting gem of a community they reside in, but others outside of Albany do. Some of the local attractions of interest include Albany’s 800-plus historic homes and buildings in four historic districts, covered bridges, the carousel project, Talking Water Gardens, the Monteith House Museum, the NW Art & Air Festival, Antiques in the Streets . . . to name just a few. This brochure includes stories about the cuisine, wine and brews, shopping and lodging. AVA has 25,000 of these brochures printed each year and distributes them all around the state. Albany’s magazine is also available online at http://www.albanyvisitors.com where is was viewed and downloaded over 700 times last year. In the photo you included with your article, Hasso, there is a brochure titled “Willamette Valley, Oregon Wine Country.” It is the publication of the Willamette Valley Visitors Association (WVVA), one of Oregon’s seven regions as designated by Travel Oregon. Albany is and has been an involved partner in that organization since its creation 20+ years ago. There are six partners that make up WVVA, they are Visit Lane County, Visit Corvallis, Visit Salem, Chehalem Valley (Yamhill County), Clackamas County Visitors Association and Albany Visitors Association. This brochure always contains information about Albany and the surrounding area as well as the other partners. Therefore, Albany does have a presence at PDX though our name does not appear on the cover. 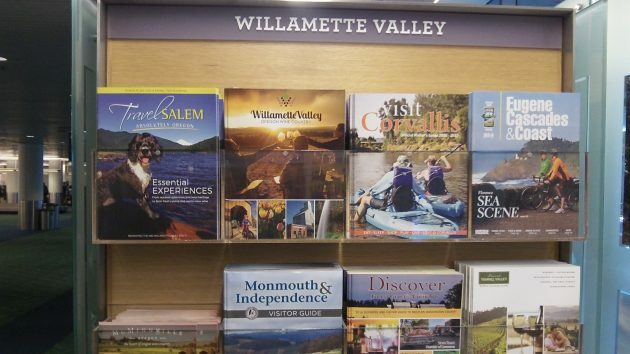 Having Albany’s brochure in those racks at PDX and other state welcome centers costs money. There are eight welcome centers around the state, PDX is an additional (9th) location. Currently Albany’s brochure is in four of those Welcome Centers if we added PDX it would more than double AVA’s current annual cost for this program. While we believe this outreach is valuable, the direct return on investment is difficult to capture. AVA has not had a visitor come in and say, “I am here because I picked up the Albany brochure at a state Welcome Center.” However, we do know that people pick them up because Welcome Centers ask to replenish their brochure stock. The City of Albany has created a Transient Lodging Tax Review Committee to look at how these tax dollars are being spent. The committee asked each organization that receives funding from these tax dollars to give presentations on how they are using the funding dollars. They also requested that recipients include a wish list . . . “If more dollars were available how would your organization use them?” One of the top items on AVA’s wish list was enough funding to be represented in all eight state Welcome Centers and PDX on an annual basis. Hasso, thank you for being so observant and always having Albany’s best interest at heart. Real information on what the world is like is vitally important.